David Price, a senior staff member in Toronto Mayor Rob Ford's office, has been suspended after a phone call to a local newspaper. 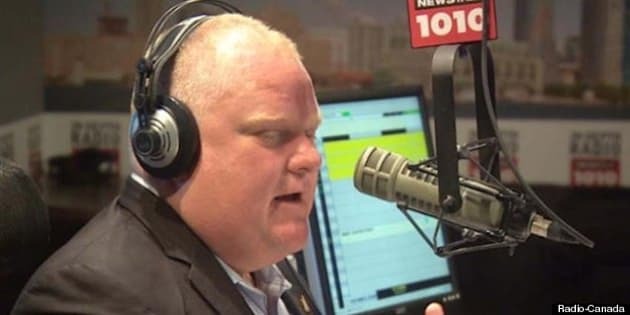 The controversy comes in response to an exclusive CBC News story reporting that Price made repeated calls to Ford's weekly radio show identifying himself only as "Dave" from various parts of the city. The calls (there were at least six) would often praise Ford and his brother Coun. Doug Ford for their work at city hall. Price, a longtime friend of the Ford brothers, wasn't on the mayor’s staff at the time the calls were made. His current title is director of operations and logistics. Many news outlets, including the Toronto Sun, followed the CBC story about calls Price made to the mayor’s show. In a story published today, the Sun reports that Price called the newspaper’s city hall bureau on Tuesday afternoon to complain about the headline in the newspaper’s online version of the story. The caller is asked if he is the same Dave who had called the mayor’s radio show. The caller doesn't give a direct answer, then hangs up. You can listen to the audio by clicking here. On Tuesday, the Sun asked the mayor’s office about the incident. Ford apologized and later told the newspaper Price had been suspended for a week without pay. The mayor's office also told the Sun that Price "admitted he made a mistake." On Wednesday, Mayor Ford said "everybody makes mistakes" and that Price was a "hard worker." When pressed further, the mayor said he would not get into personnel issues. Two city councillors told CBC News that they were baffled as to why Price would contact the newspaper in such a manner. Coun. Ana Bailao said there are "appropriate channels" to pursue if someone at city hall has an issue with a media report, including contacting an editor or writing a letter to an editor. Coun. Paula Fletcher said that her staff "would never pick up a phone and have a conversation with any of the press gallery about something that was said about them." After hearing that Price had called the Sun in the manner that he did, Fletcher said "it's a very odd use of your authority and prestige, very odd use — perhaps a misuse of that." This isn’t the first time that Price, who also worked on Coun. Doug Ford's campaign in 2010, has made news. In May, Price asked his colleagues in the mayor’s office if they should try to obtain a video that is alleged to show Rob Ford smoking crack cocaine. A senior source in the mayor's office told CBC News that Price contacted the mayor's then chief of staff Mark Towhey, asking him “hypothetically” what they would do if someone told him where the video was. Towhey, who was fired days later, responded that police should be contacted. The mayor has said the video doesn’t exist, and the video has yet to surface. Ford has also said he does not use crack cocaine and is not addicted to the drug. Since the reports about the video emerged in the Toronto Star and on the U.S. gossip website Gawker last month, Ford has had a number of staff members leave his office. In addition to Towhey's departure, Ford saw two press secretaries resign and a policy adviser and his executive assistant leave. The CBC's Jamie Strashin reported Wednesday that another long-time staffer, Chris Fickel, who had recently served as the executive assistant to the mayor's chief of staff, had left Ford's office. The mayor's office told CBC News that Fickel had been planning to leave in June, saying that he left on "good terms" and of his own accord. Ford has served as the mayor of Canada's most populous city for the past 2½ years. Before he was elected mayor, he served as a city councillor representing Etobicoke North, the Toronto suburb where he lives with his family.